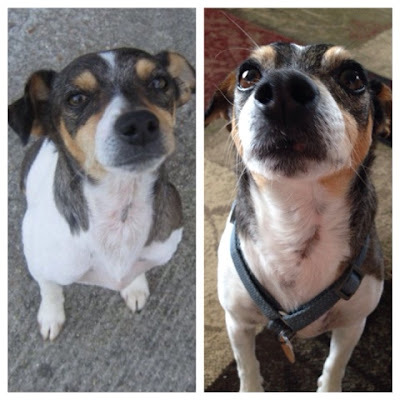 Watson’s very own “Way Back Wednesday” – 2010 at left, 2015 at right! I had to jump in on Watson Wednesday and share a funny story about…Watson, of course! As much as I like to keep this post limited to a picture (or two) I just couldn’t resist sharing what happened last night. My Mom and I went to a friend’s house for coffee; something we do pretty often, and we decided to leave Watson out to roam free in the house – we’d only be gone about 2 or 3 hours. Well, I suppose a killer storm rolled through while we were gone (we were literally 5 miles away, I don’t know how we missed it…) and Watson had some feelings about it. I topped the stairs, thinking we’d been robbed…and found the rugs in my bathroom flung around and bunched up…and I had to immediately laugh. I knew exactly what weird something was going on! The weather had obviously spooked Watson and so he ran willy nilly through the house, ruffling up the rugs and trying to burrow between two pillows on my parent’s bed. Nothing was hurt, but he’d obviously gone a little wild when the weather rolled through.